We, Kemal Dönmez and Barbara Duiven will welcome you warmly. Enjoy your welcome drink while we give you all necessary information to explore Cappadocia and free maps for hikers. Barbara knows the area like the back of her hand and loves to guide her guests through the valleys. Kemal is a professional cook and serves excellent traditional Turkish meals. On request we also arrange excursions around the area, both private daytrips or tours in small groups. In our big green garden full of fruit trees you can enjoy our extensive organic fruit filled breakfast or Kemal's delicious dinner. Our rooftop terrace offers a spectacular view of the old village Göreme with its cave dwellings and the surrounding hills. Attractive in every season: after your adventures you can relax in our garden, on the rooftop terrace or our inviting Ottoman restaurant, enjoying a glass of good Cappadocian wine or a pot of Turkish tea. 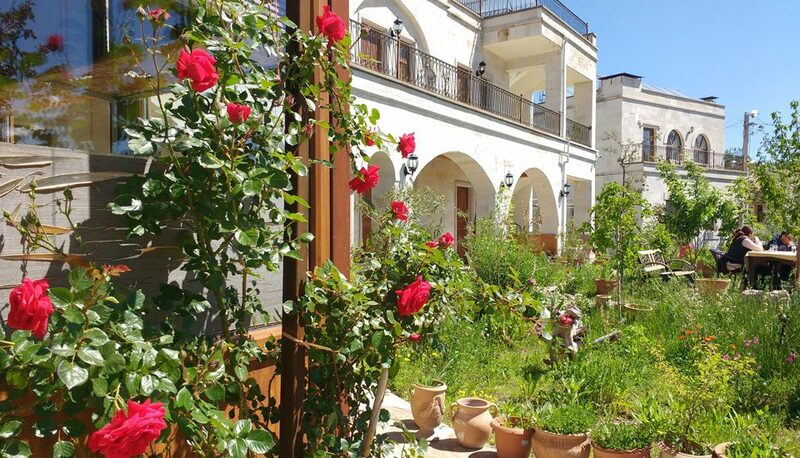 Kemal's Guest House is an Ottoman house in typical Cappadocian style, just off Göreme Center. All 8 Deluxe Standard double and triple rooms are built in local natural stone with an authentic wooden ottoman ceiling and a Travertine bathroom. Decorated in Turkish style and with TV, coffee/tea facilities and own terrace to the garden or terrace. All rooms are cool in summer and comfortably heated with central heating in winter. In the green garden and on the terraces you can enjoy the wide views and the sun. There is free Wi-Fi and parking.